Scottish producer of all kinds of hand-made art goodness, Creo Designs, release their latest design, The SlumberBean upon us today. The SlumberBean was originally by illustrator Sam Hadley (also known as Slumber) in 2010, and already stars in a series of illustrated prints, but now he’s ready to snooze around your home in a new limited series of Art Figures called ‘Flavour Friends’. SlumberBean features in the Pictoplasma Character Compendium, and has been exhibited in Bristol, Berlin and Madrid. Cast in Creo Design’s unique PU resin and sitting 5 inches tall, SlumberBean has been hand crafted, cast and painted to perfection by Creo Design. He even comes tucked-up in his own bean can with an exclusive label designed by Slumber. 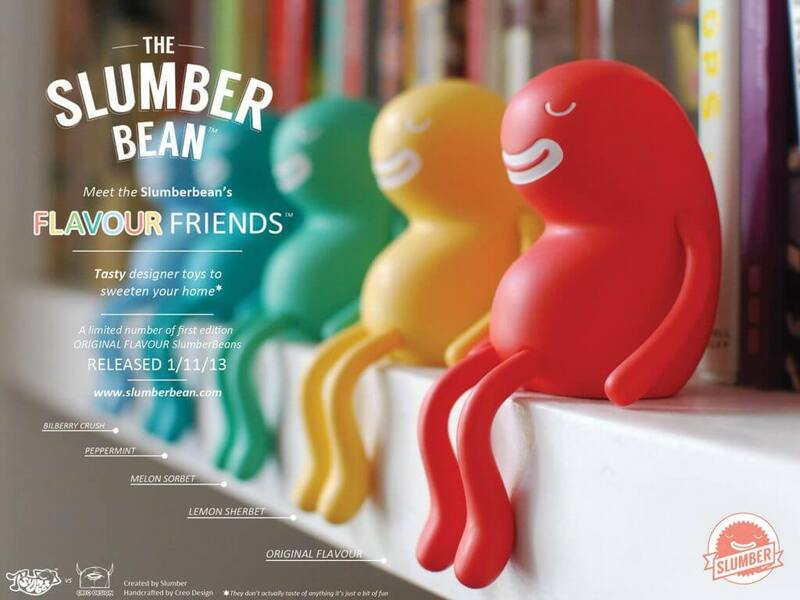 The SlumberBean & Friends are now waiting to relax anywhere you like. The packaging, as you can see from the image below, is pretty sick. Obviously taking inspiration from Heinz. The first edition ‘Original Flavour’ drops Friday 01.11.2013 at mid day GMT from http://www.slumberbean.com for £30 Ex shipping. Each Flavour is limited to 20pcs. The first edition of Original Flavour will be 10 pcs with 10 more to follow. So be quick to grab your Original Flavour before they’re gone. Slumberbean is a sold cast art piece with no articulation. SLUMBERBEAN from SlumberBean on Vimeo.